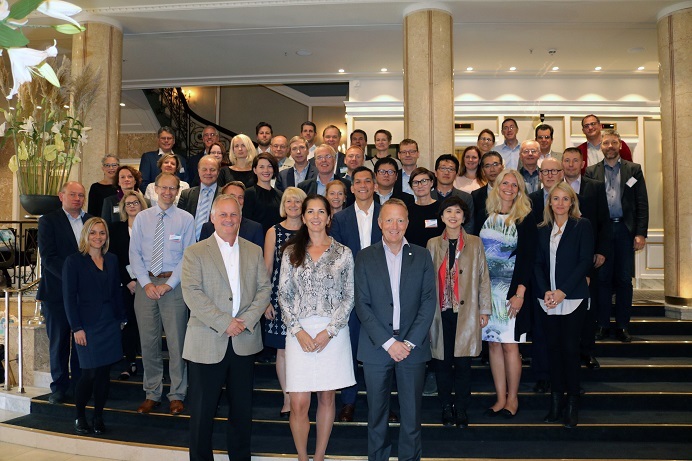 From 25 to 28 September 2016 the annual conference was held in Oslo, Norway. This year it was joint TWN and PuRE-net event, organised by Statsbygg (Norwegian Directorate of Public Construction and Property) and Forsvarsbygg (Norwegian Defense Real Estate Agency). The 200 year anniversary of Statsbygg gave a special touch to the program. Statsbygg is both PuRE-net and TWN member, Forsvarsbygg is TWN member. Themes touched upon in this conference were, among others, Efficiency, BIM and Security. For more information on the conference please click here. Since 2013, the “Strategy and Business Models” working table has been focused on describing the different agencies based on their commonalities and their difference from a strategic point of view. After comparing their different paradigms (2013), their business models (2014) and the game changer in public real estates (2015), the participants analysed this year the different rent models, their goals and identified strategies to reduce the total cost of ownership for public real estates. The working table took place in Germany and was hosted by the Bundesanstalt für Immobilienaufgaben. The meeting was attended by 22 participants from 10 member countries (Belgium, Czech Republic, Denmark, Estonia, Finland, Germany, Latvia, Norway, Spain, United Kingdom) and was located at the historical building Kronprinzenpalais. The different member states presented their measures for an effective space management of governmental buildings to reduce costs and create synergies. 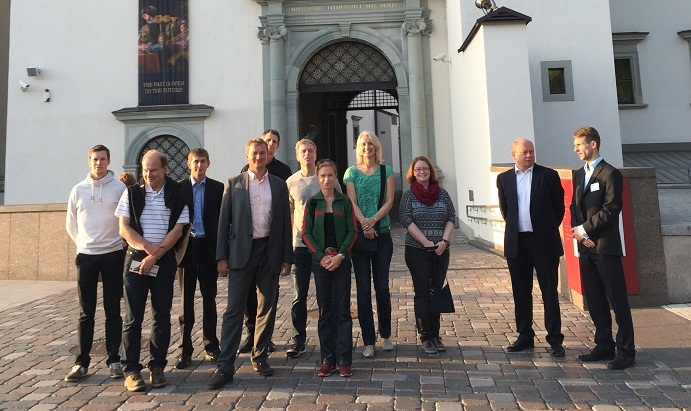 The 2015 annual meeting has been kindly hosted by BIG (Bundesimmobiliengesellschaft) in Vienna, Austria. 25 delegates from 12 member organizations gathered to discuss trending topics in public real estate. During the general meeting, Mrs Yvonne van der Brugge-Wolring, the Netherlands, was elected as the new PuRE-net president and chairman of the Board (Steering Committee). Mr Kristian Lyk-Jensen, Denmark, and Mr Vaidotas Aleksius, Lithuania, were appointed as new members of the Steering Committee. All have been elected for a period of 2 years. According to tradition, the PuRE-net secretariat will follow the president, and will therefore be taken up by RVB, the Netherlands, as of 1 January 2016. For more information about the Annual Conference, please contact the PuRE-net Secretariat. The materials regarding the conference can be found here. Bygningsstyrelsen (Danish Buildings Agency) hosted the worktable moderated by David C. Lottenbach on the subject "Game Change in European Public Real Estate 2016-2020". After having studied the Strategy paradigms in 2013 and business models in 2014 from the point of view of models and CEO perspective, the 2015 worktable focused on the dynamics side, i.e. on the "game changers" of European public Real Estate of the next 5 years - identifying the triggers of change, the impacts on the PuRE agencies' business models and assessing likely adaptation paths by the agencies. The working table used guided "Delphi" method and the meeting preceded three phases of Delphi on-line surveys with the participation of 9 countries - Bygningsstyrelsen (DK), Direccion General del Patrimonio del Estado (ES), Úřad pro zastupování státu ve věcech majetkových (CZ), Statsbygg (NO), Bundesimmobiliengesellschaft (AT), Cabinet Office - Government Property Unit (UK), Regie des Batiments (BE), Senaatti Kiinteistöt (FI), Office for Public Works (IE). Participants identified trigger factors that are most likely to challenge the performance of the public real estate sector, defined PuRE impact scenarios and PuRE adaptation paths. All the participants expressed common wish to continue the work of Strategy working table in 2016 and prepared a list of topics to be discussed in PuRE-net in the coming years, which will be submitted to the upcoming Annual Conference Meeting. Geoffroy Magnan (Belgium) hosted and Andreas Juen (Austria) organized the Working Table on Energy Efficiency on October 5.-6. in Brussels. A total of 16 participants from 7 different countries participated. The focus was on the exchange of experiences with the implementation of the EU Energy Efficiency Directive in the seven countries and to find answers to the following questions: What are key reasons for customers to pay more for energy efficient buildings? What can “we” offer thus customers contribute to higher cost? The Working Table on Office space solutions was presided and hosted by Lithuanian Turto Bankas. 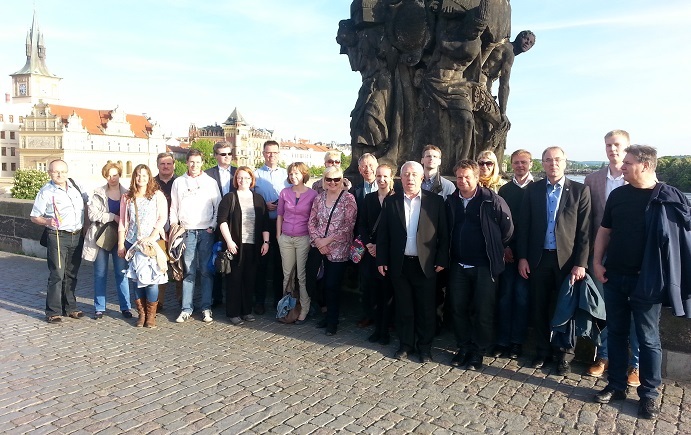 The Working Table met in Vilnius on September 17-18th, 2015 to discuss PPP projects. 16 representatives from 7 countries presented existing legal environment of Public Private Partnership in their countries and shared best practice in managing PPP projects focusing on administrative buildings. There were also presented non-traditional students’ dormitory project with implementation of renewable energy solutions in Lithuania as an efficient space planning example and real estate tendencies in three Baltic countries focusing on business centre market and development. If you are interested in learning more about the Working Table’s results, please contact Marius Umbražiūnas. The WT was presided by Statsbygg, Norway while the Office for Government Representation in Property Affairs (OGRPA), Czech Republic, was the host. 24 representatives from 11 different countries participated in the meeting. The focal point of this WT was the measures and KPI’s in the management of public real estates. The WT was aimed at sharing experience with measures and KPIs on the level of the real estate and on the corporate level. Detailed discussion on measures and KPIs is expected for different groups (kinds) of buildings as well as for the three basic processes (acquisition, management and disposal) of the life cycle of the building. Also the way of the use and implementation of the KPIs in the everyday business of the state real estate companies is worth to study. It is with immense sadness that we inform you about the unexpected death of Carsten Jarlov, our president of PuRE-net and CEO of Danish Building and Property Agency. From the early days of existence of PuRE-net, Carsten has been actively involved in our European Real Estate network. First as well-respected member of our Steering Committee and since 2012 as president of our network. His enthusiasm and vision made him a unique leader of our network, whose commitment and dedication have helped PuRE-net to develop into the strong network that it is today. We lose a great leader, but more importantly, we lose a great friend. He will be severly missed by us all. 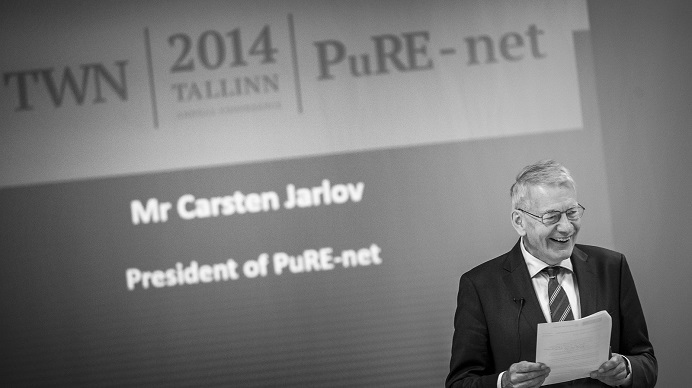 The 2014 PuRE-net annual meeting took place 7-9 September in Tallinn, Estonia. The meeting was a joint adventure with The Workplace Network, TWN , and kindly and excellently hosted and organised by Riigi Kinnisvara AS – the Estonian state real estate company. The combined meeting of the two networks gathered some 60 CEOs, managers and specialists in public real estate from a total of 21 different countries. 16 out of 20 PuRE-net members were present, which is record. The meeting demonstrated that PuRE-net is a thriving network with vitality and momentum, which was underlined by an ambitious work plan for the coming year. If you are interesting in learning more the annual meeting or PuRE-net in general, please contact Peter Torp Madsen. The Working Table on Core Business Information Systems was jointly organised by the Office of the Government Representation in Property Affairs of the Czech Republic together with the Dutch Central Government Real Estate Agency. The Working Table met June 19-20 in The Hague to discuss the subject "Reporting tools and KPIs in the software used for RE Management". 22 representatives from 11 countries discussed the summary of the answers that were given to a questionnaire on this specific subject. All of the responding countries use management reports and KPIs while a vast majority are using these in their information systems. Regardless of choice of real estate management software, most countries use readymade Business Intelligence reporting tools available on the market. Despite the variety in legal conditions and in portfolio composition among the different countries and agencies, the participants agreed that there are similar requirements on reports and KPIs. However, different tools are used in order to meet these requirements. To become an outstanding public Real Estate Manager the participants specified the following targets: 14 measures at the portfolio level, 18 measures at the building level as well as 10 KPIs at portfolio level and 7 KPIs at building level. The discussion showed that some countries have started to implement managerial dashboards gradually, both on portfolio and building level as an additional tool of the software. The main message of the Working Table is that securing correct and updated data and comprehensive data definitions are the basic preconditions for applicable management reports and KPIs. The Working Table recommends that the meeting in 2015 should discuss the evolution that the real estate management information systems have seen over the past five years. Additionally, the meeting should debate the intended upgrades for the nearest future and generally continue the subject of management reporting and KPIs in further detail. 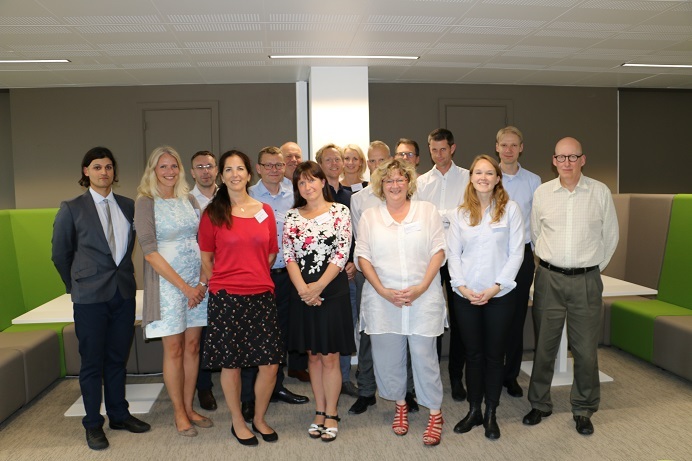 The Working Table on strategy and business models met June 12-13 2014 in Copenhagen to exchange insights from the studies of the business models of the participating agencies and to make comparative analyses. The analyses of the business models had been carried out by an external consultant, David Lottenbach, who also supported and moderated the session in Copenhagen. The project built on the results' of the 2013 Working Table on strategy paradigms. Whereas in 2013, the group looked at differences of owner paradigms, focus in 2014 was on practical commonalities in business model design and implementation. The Working Table identified common strategic challenges and how they can be tackled, and in doing so, finding common points of implementation (e.g. organisation setups). Nine countries were part of the working table in 2014 as the team of 7 organisations who began the work in 2013 were joined by BImA (Germany) and OPW (Ireland) this year. 15 people from 9 different countries participated in the joint meeting in Copenhagen. The Working Table is expected to continue in 2015, building on the results from 2013 and 2014 while focusing more on the practical implementation challenges of the business models. If you are interested in learning more about the Working Table and its results, please contact Peter Torp Madsen. 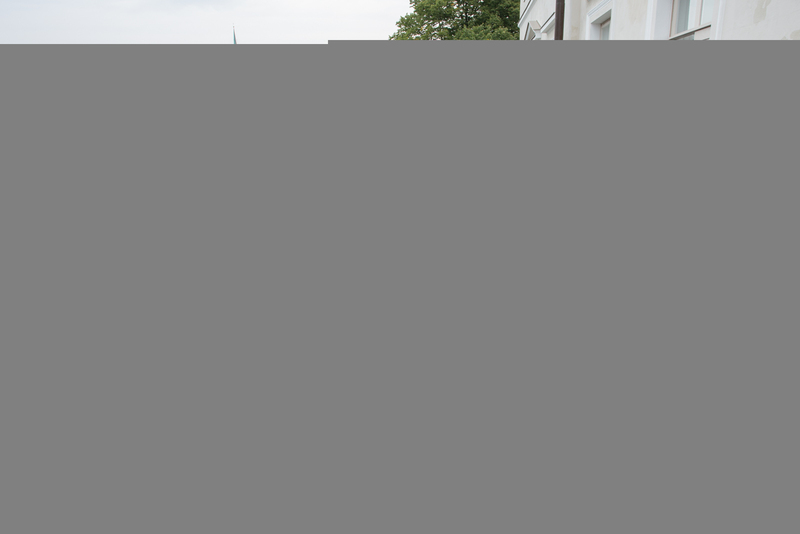 The meeting took place in Bonn and was hosted by the The German Bundesanstalt für Immobilienaufgaben. The event took place from the 4th to the 5th of June 2014. The meeting took place in Brussels and was hosted by the UK BIM Task Group. The event took place from the 25th to the 26th of March 2014.